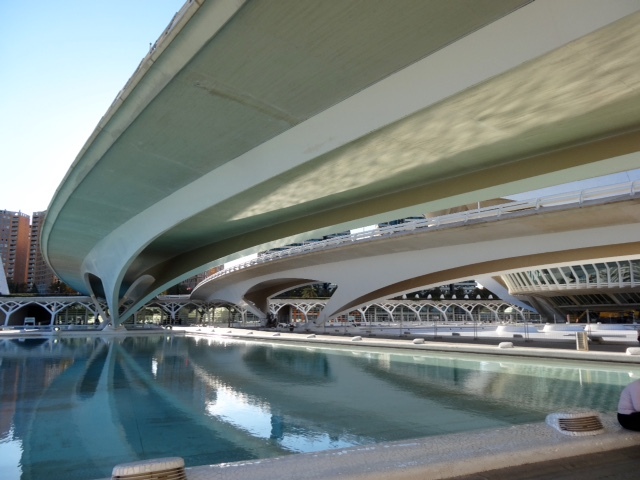 Valencia’s Turia river was prone to flooding and after a particularly damaging flood in 1957 that destroyed many buildings and caused numerous deaths it was decided to divert the river to the outskirts of town. 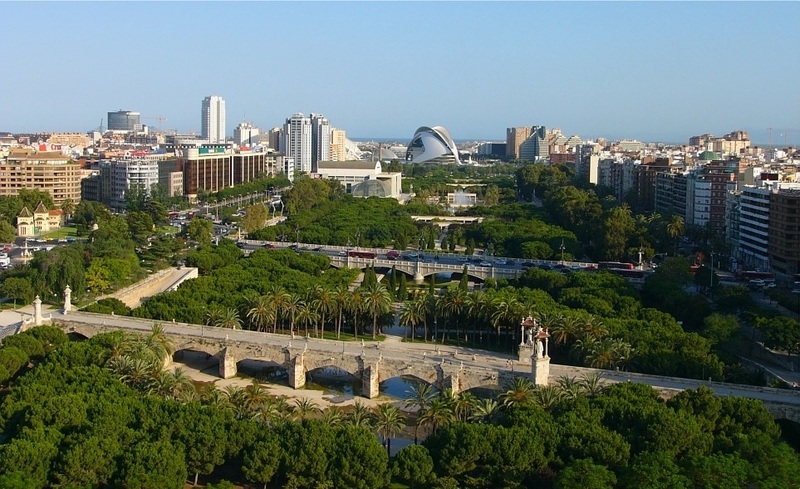 The old river bed through the centre of Valencia was developed as a nine kilometre sunken park, called the ‘Garden of the Turia’, complete with paths, ponds, fountains, playgrounds, climbing walls, gardens, trees, cafés and cultural buildings. 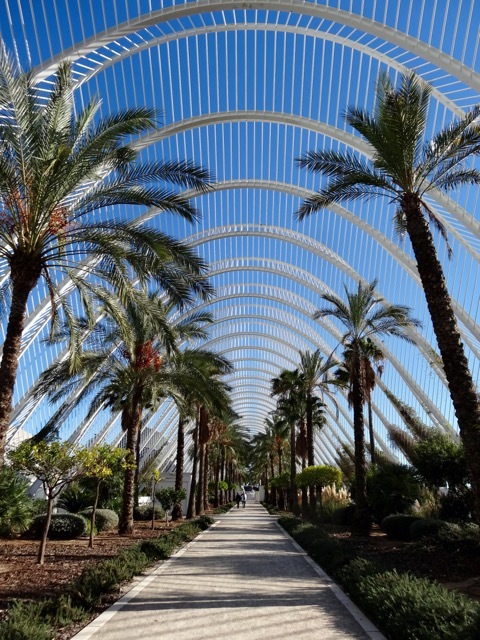 This photo is from Google Images. I thought this was a brilliant idea. 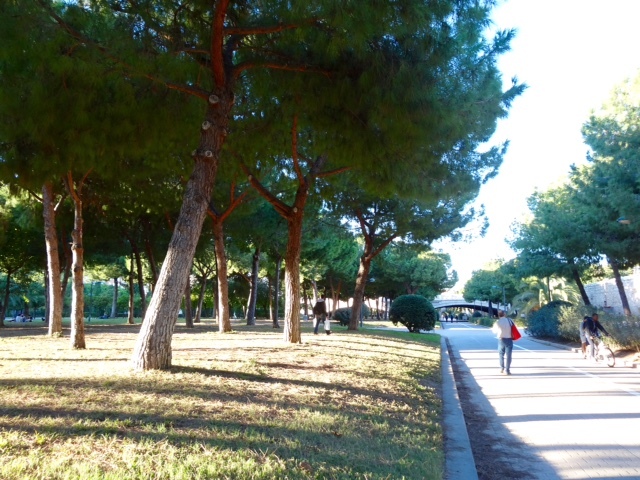 We walked from the Old Town along this riverbed park all the way to the City of Arts and Sciences. 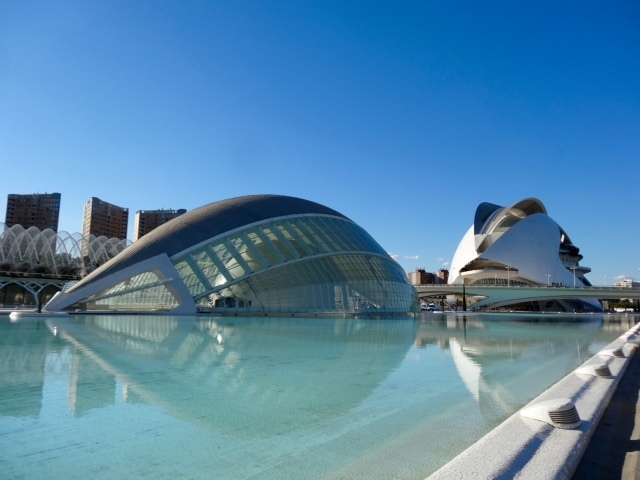 “The City of Arts and Sciences in Valencia is one of the largest scientific and cultural complexes in Europe. 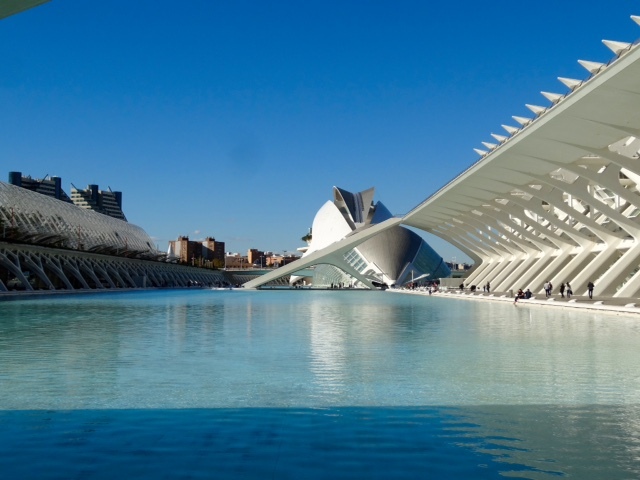 It is made up of impressive buildings such as the Hemisfèric and Oceanogràfic, and stands out because of its avant-garde architecture, designed by renowned architects Santiago Calatrava and Félix Candela. 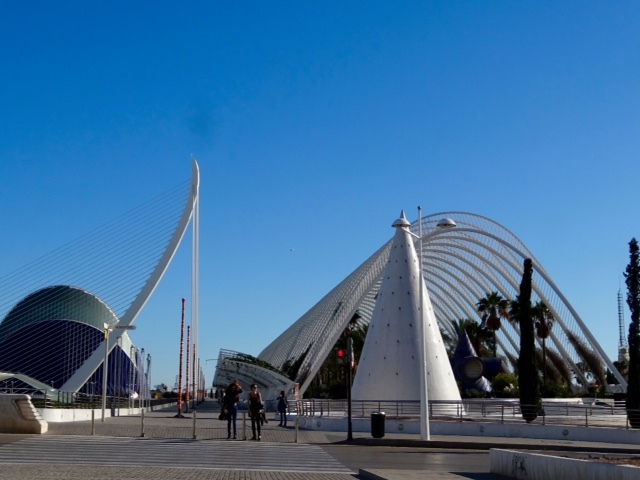 We decide not to visit any of the exhibits as we simply don’t have enough time to visit six buildings full of exhibits and activities. 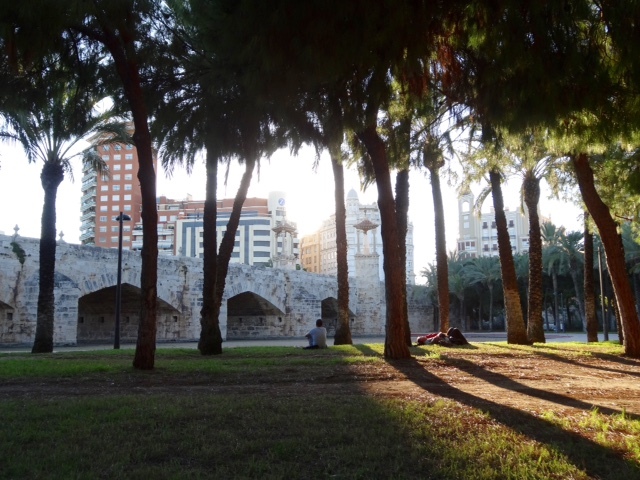 So, wander with us as we explore…and if you want, there is even more information here. 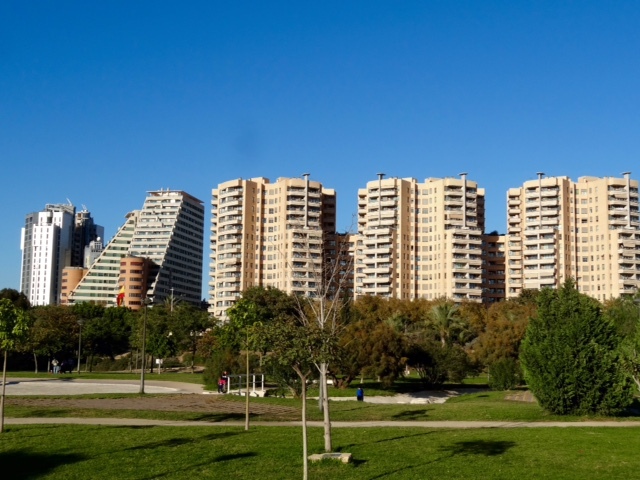 Spanish cities are very densely populated as you can see from all these high rise apartments right beside the park. 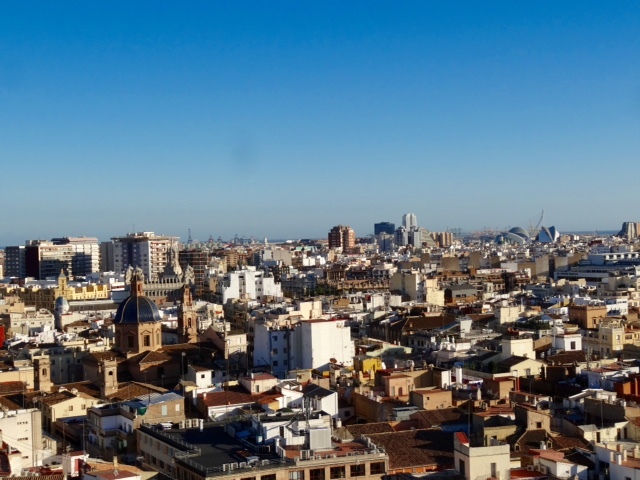 If you live in a Spanish city, you will most likely be living in an apartment! 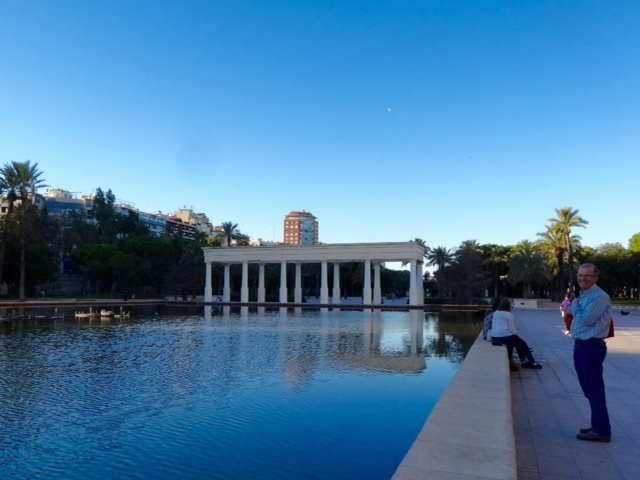 Here are a few photos of Turia Park taken on our walk back to the metro station near Old Town Valencia. Under one of the many bridges that carry traffic and pedestrians over the park we looked up and noticed these fantastic water spouts! 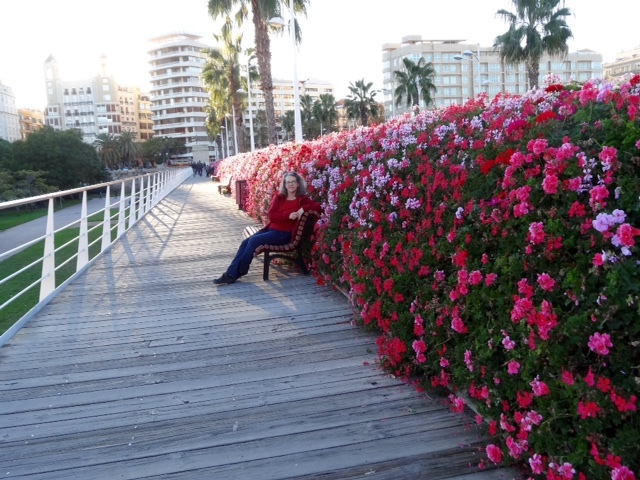 Another bridge had pedestrian walkways on each side of the roadway, bordered by these colourful flowers. 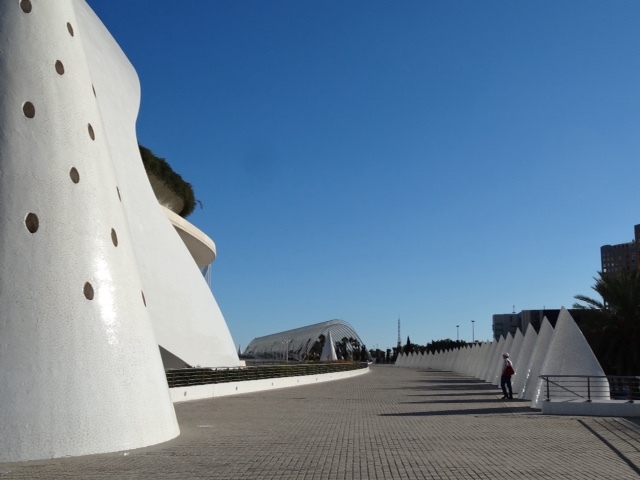 Parque Gulliver is the most amazing playground I have ever seen. I found this arial view here. I do need to find out how to properly credit photographs I ‘borrow’ from the internet. 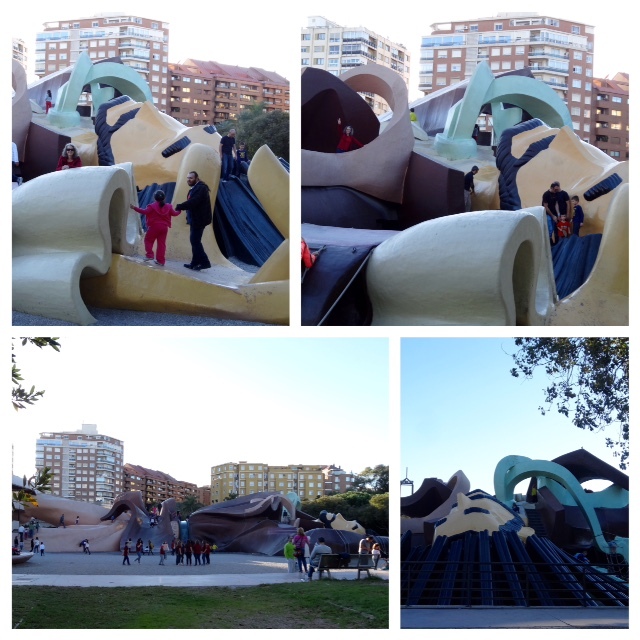 Gulliver Park is an enormous playground with slides, ramps, caves and stairs based on the novel Gulliver’s Travels. I could not resist joining in on the fun but I was unable to convince Bob to join me. 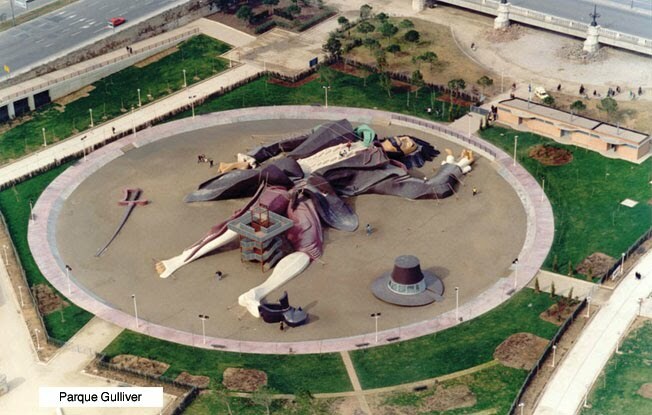 I found it quite interesting that there are no fences or railings anywhere on this giant sculpture of Gulliver even though there were many places where it would have been quite easy to fall from quite a height. I don’t think this playground would be allowed back home. 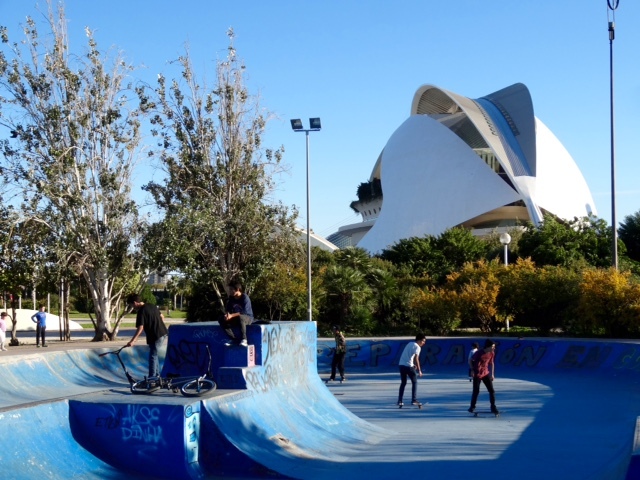 If you Google ‘Valencia Gulliver Playground Images’ there are lots of more interesting photos. 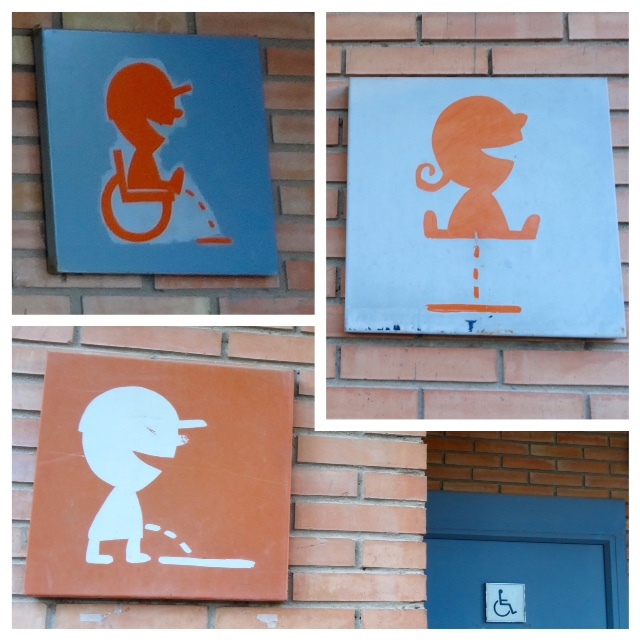 The washrooms beside this playground had the cutest signs we on the doors to the facilities. 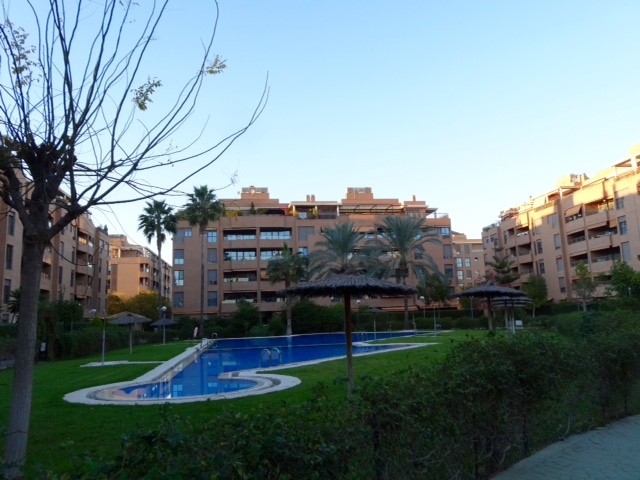 Just as the sun is setting we arrive back at our apartment complex. 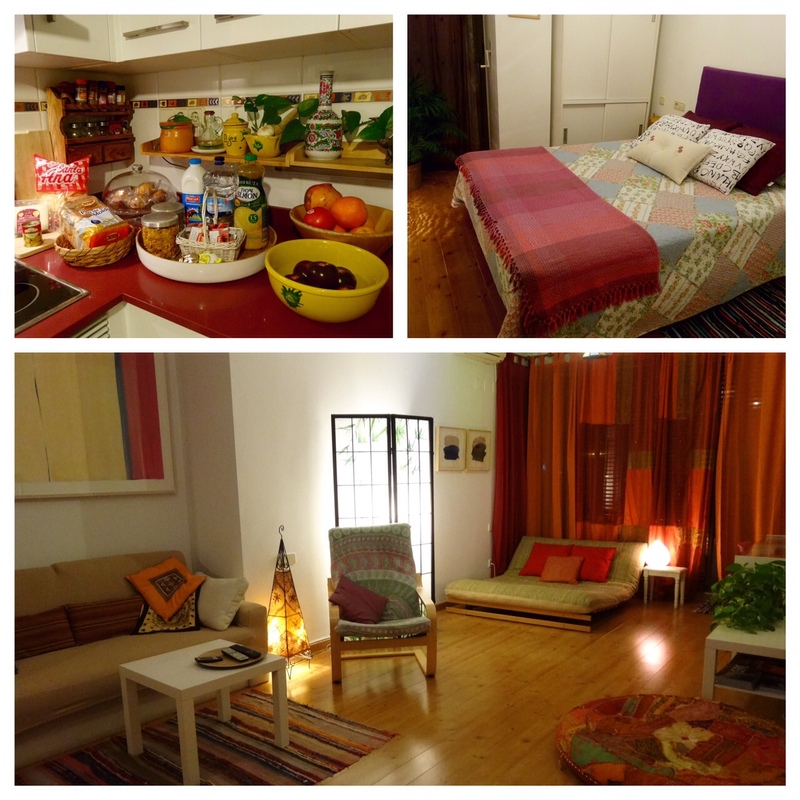 Our apartment in Valencia is a short metro ride from the old part of town. We bought four tickets to get us into town and home again. However when it came time to go home our tickets weren’t working. Turns out we purchased four tickets that had to be used all at the same time so the other two were no longer valid. It cost us over € 9 for two one way tickets because we had also chosen too many zones. We bought two tickets to get home for only €3, however we later discovered that we could purchase ten tickets for €7.20, only €.72 a ride! 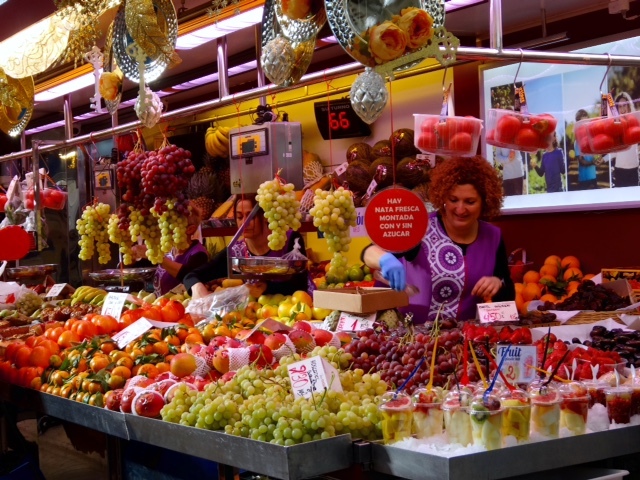 First stop today is the Mercado Central, a market held in a huge iron, glass, and tile Art Nouveau building. 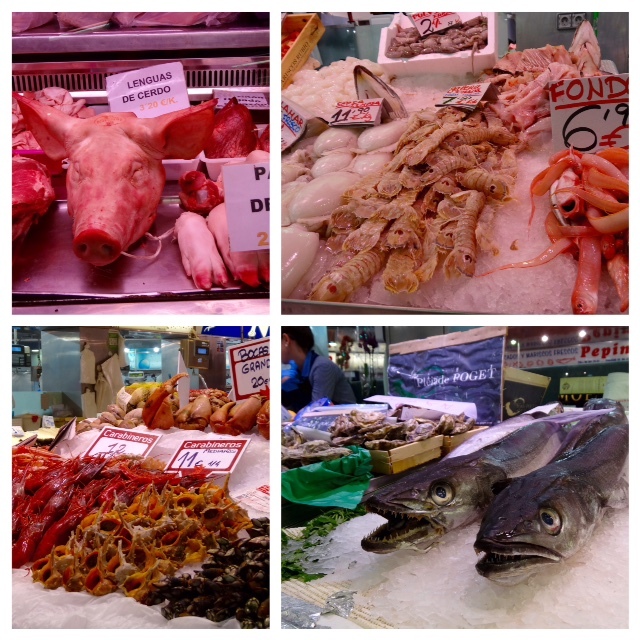 The meat and fish aisles are always interesting, so different from our stores back home. 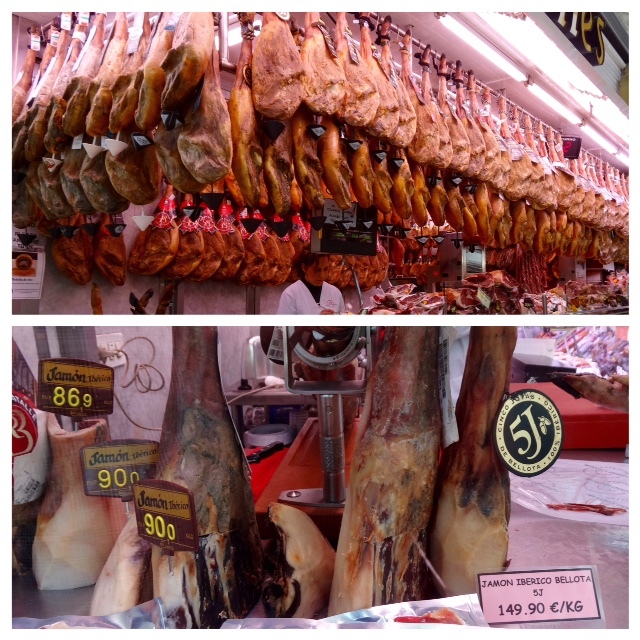 Hams are a big seller in Spain and I still find it strange to see them hanging in shops. 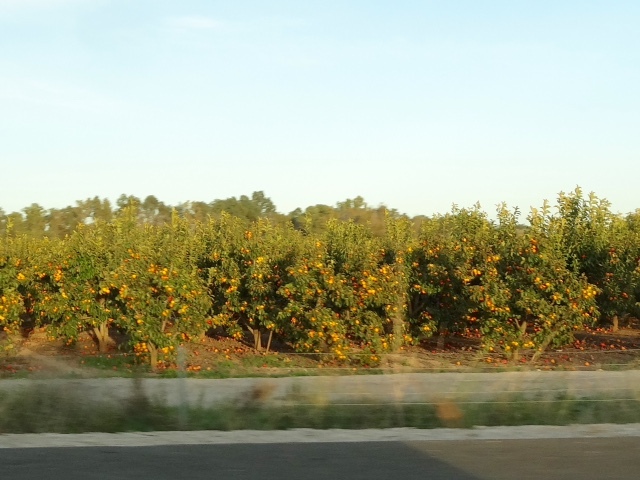 No refrigeration seems to be needed, and take a look at the prices, up to €149 a kilogram! 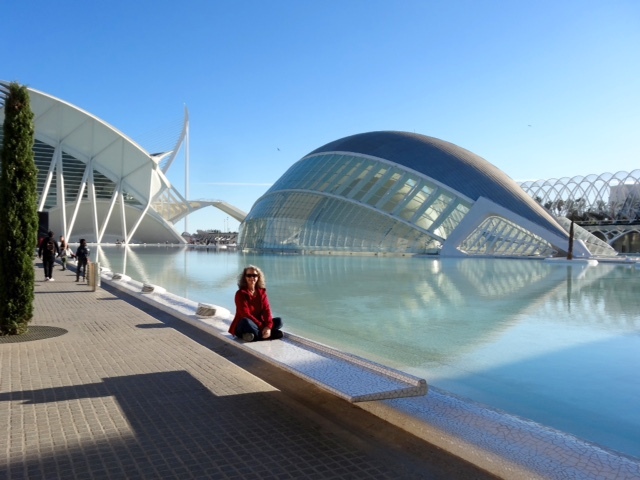 We bought some fruit for a snack and then headed towards the Valencia Cathedral. 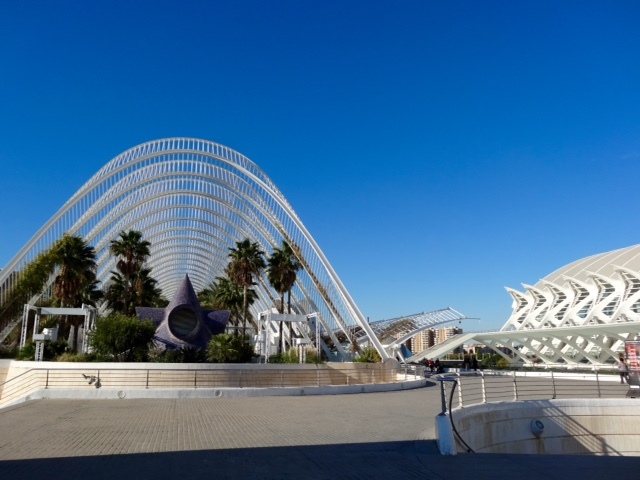 Yes, another cathedral! 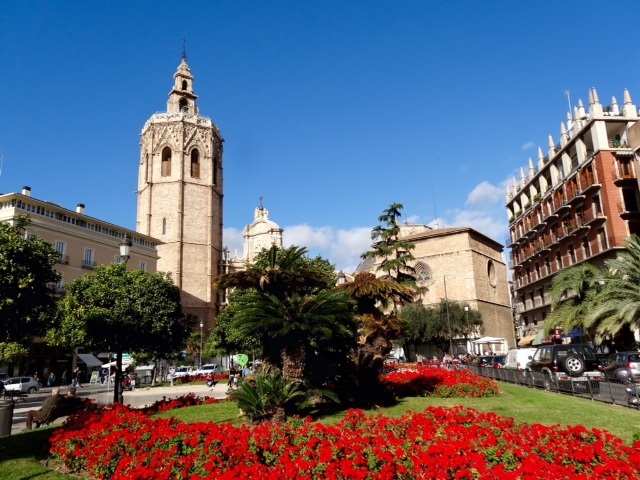 Some refreshments and a rest in this lovely plaza and we are ready to check out the cathedral. After skirting past the gypsy women begging on the streets and the church steps we enter yet another magnificent cathedral. 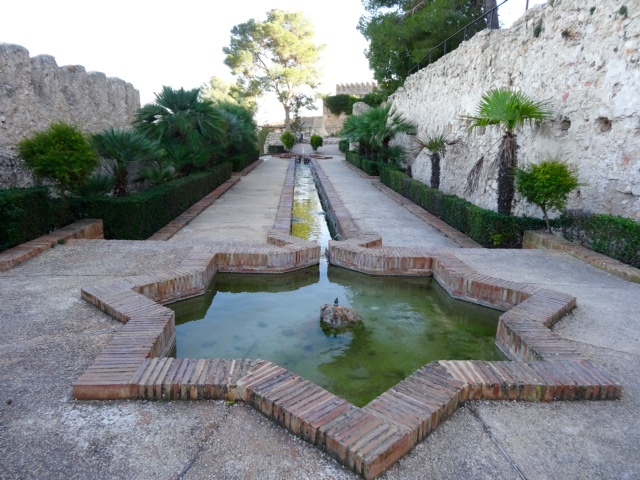 Originally built in 1262, it has been added to throughout the centuries and it now has three entrances. The one we chose gave us this view of the cathedral as we walked through the doors. The day light just before the altar comes from this beautiful octagonal dome. 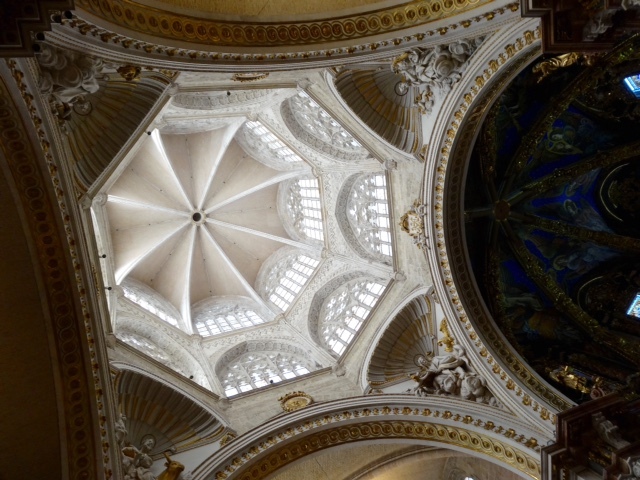 There is another gorgeous dome over the Chapel of St. Joseph, which is one of twenty eight smaller chapels located in this cathedral. 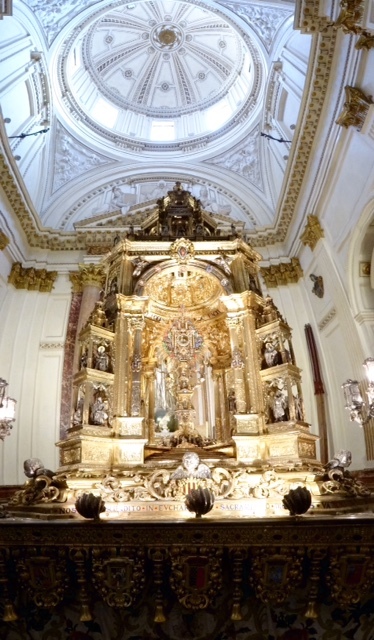 Most of them are incredibly ornate with lots of gold and jewels and carvings. 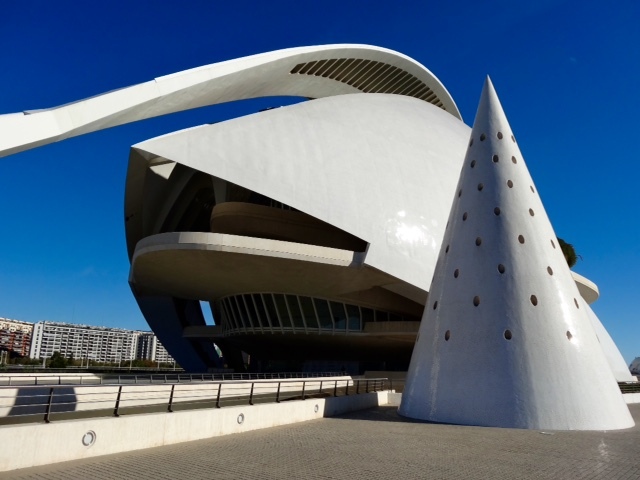 Although these magnificent cathedrals are truly awe inspiring, we wonder about all the money that has been spent building them and we are also quite aware of the church’s role through out history. So many horrors have been perpetrated in the name of religion. It is a strange sort of paradox. 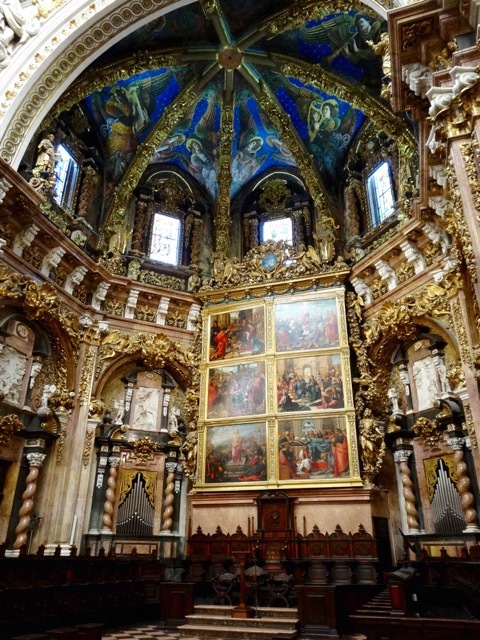 The high altarpiece and the frescoes are amazing. We sit for quite some time just in contemplation. This is Bob’s favourite altar of all that we have seen so far. The frescoes of musical angels on the dome above the altar were only discovered in 2004 during some restoration work. They had been covered by a wooden ceiling and no one knew they were even there. Click here if you want to read more. Here is another view of the main aisle and one of the side aisles with the smaller chapels. 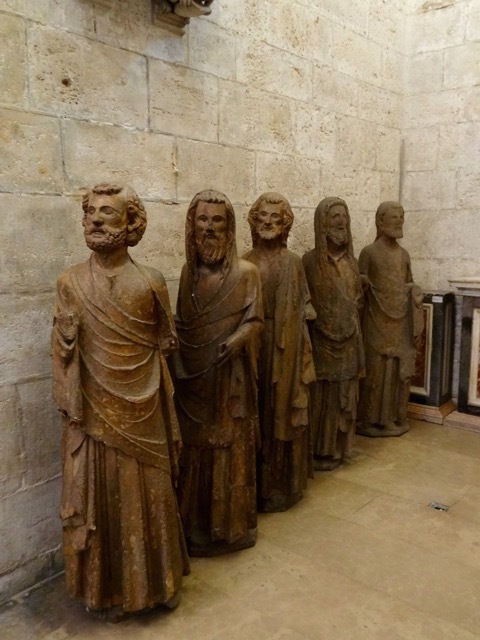 These life size statues of the Apostles are from one of the entrances to the cathedral. They have been replaced by copies and the originals are now kept inside the cathedral museum for safe keeping, but it was closed for renovations so they were displayed in an alcove. An intricately carved altarpiece, built in the 16th Century holds the Holy Chalice, which is said to be the chalice Christ drank from at the Last Supper. 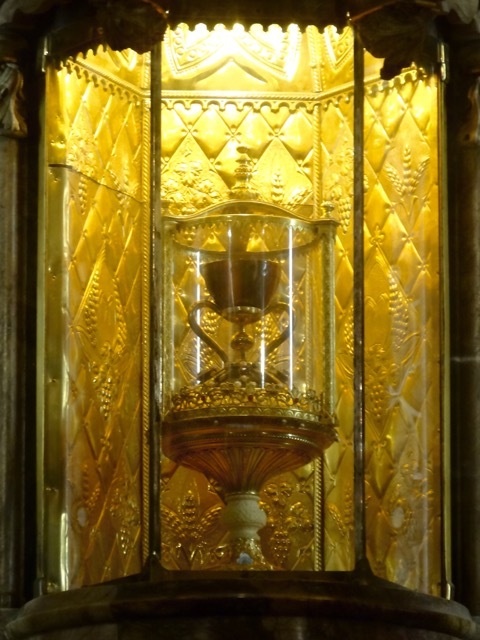 And here is the Holy Chalice, aka the Holy Grail. There is more information about the history of the cup here. We were told that there is more scientific investigation currently taking place to prove that this is indeed the cup that Christ used at the Last Supper. 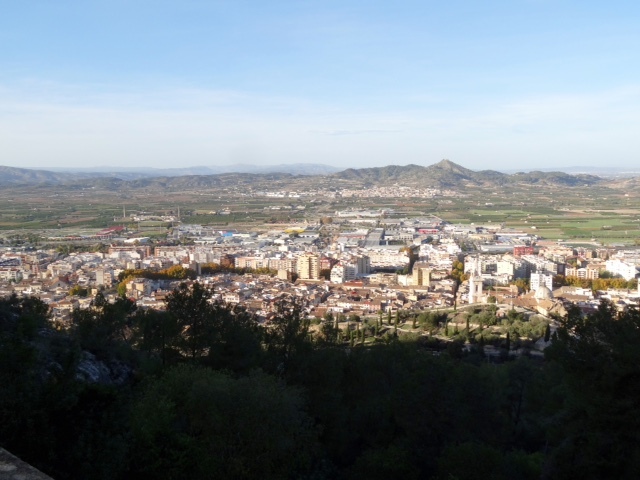 We climb 207 steps to get to the top of the Torre Del Micalet. 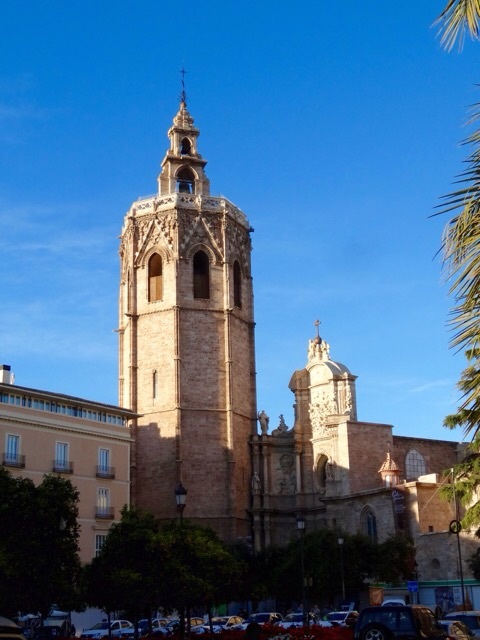 Construction of this bell tower started in 1381 and it is one of the most important landmarks in Valencia. 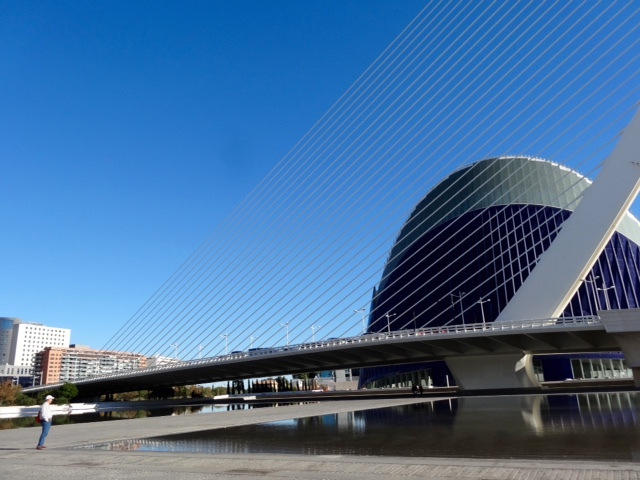 Here is El Micalet, cast in 1539, and weighing 11,000 kilograms. Shortly after this photo the bell chimed the hour. It was very loud! 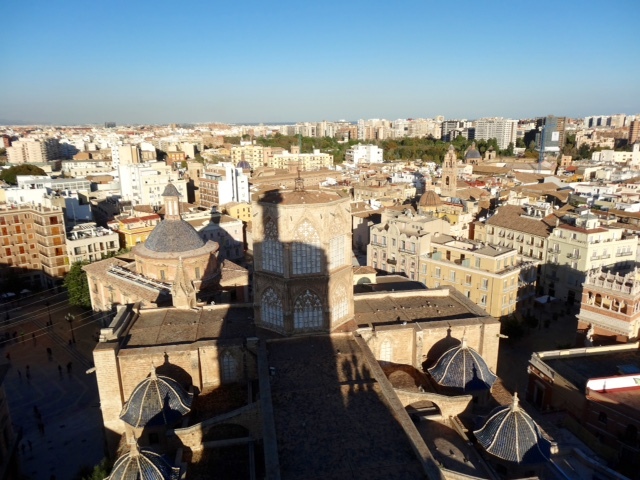 All cathedral bells have names, and this cathedral has 14 bells ranging in size from 11,000 kg to 260 kg. 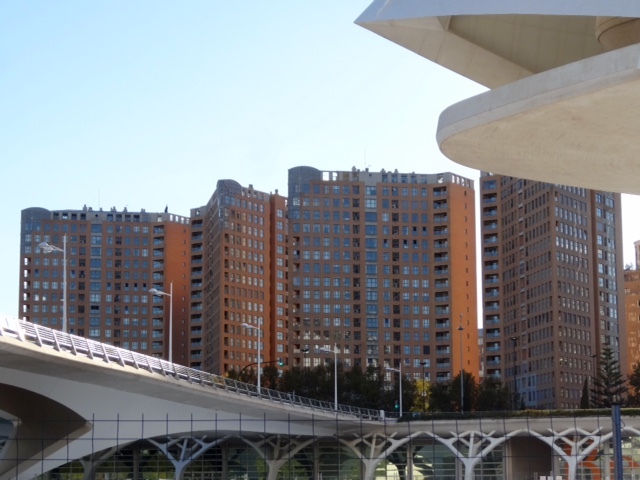 We spend quite some time up here, admiring the view, and enjoying the sunshine. The octagonal tower on the roof in the center of the picture is the outside of the white dome above the altar and the dark domes are above the side chapels. 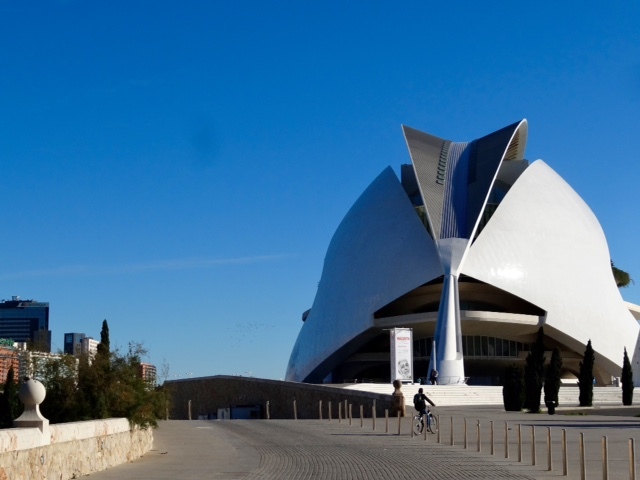 The two curved buildings just visible on the skyline on the far right hand side of the picture are part of the City of Arts and Sciences Complex. 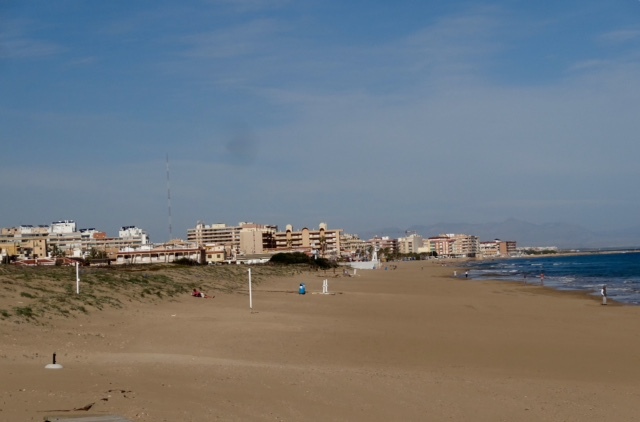 We are going there tomorrow. Now we need to descend the 207 spiral stairs that we climbed to get to the top of the tower. We have certainly done our share of stair climbing this trip. 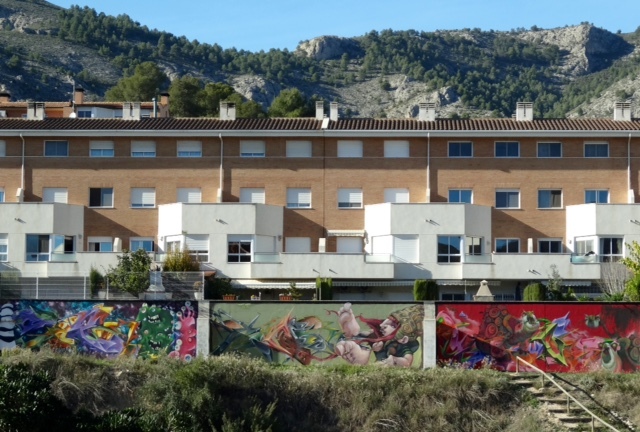 Valencia has a ‘dragon house’ so of course we have to find it. 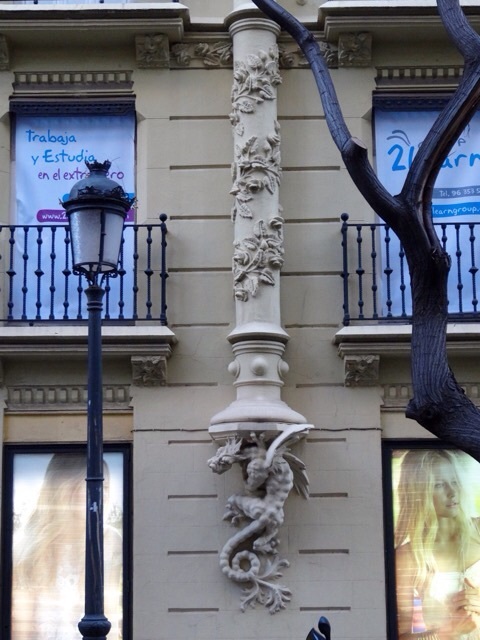 I’m not sure what I was expecting but I was a bit disappointed to only find one small dragon sculpture over the doorway and two pillars with a little dragon on the bottom of each of them. In case you didn’t know, I love dragons. 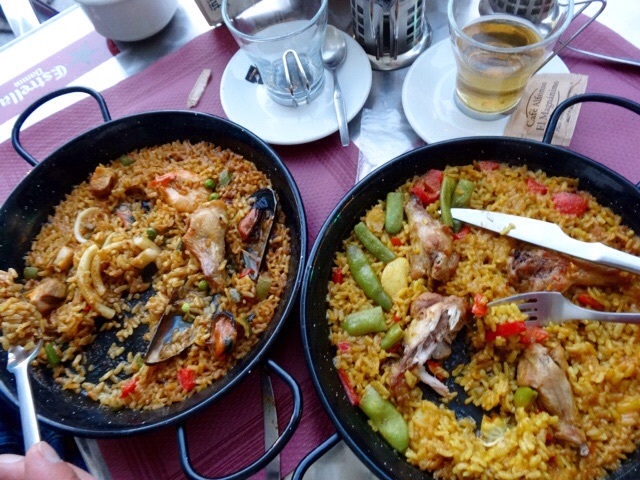 Bob finally gets to try the seafood paella he wasn’t able to have on his birthday. 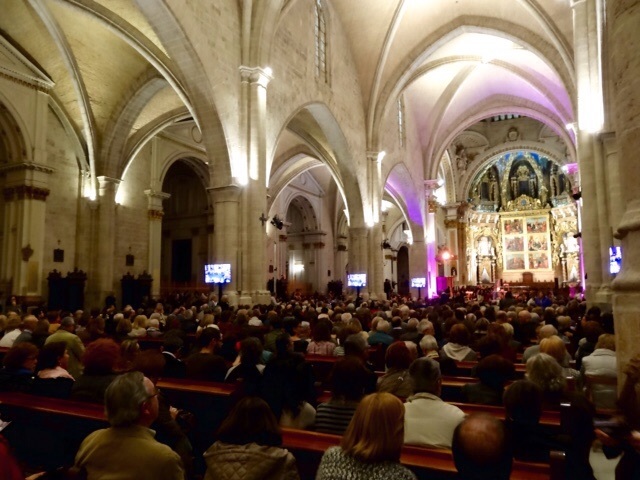 We make our way back to the Cathedral for a concert. Bob thought we would be way too early but when we arrived about forty five minutes before the concert it was already packed. We managed to find seats in the side aisle near the altar, which was actually behind the stage, but there were TV screens so we got to see most of it. We both enjoyed the performance even though we weren’t exactly sure what it was all about. A young boy sang several songs and it seemed to have something to do with Christmas. The Christmas lights were on after the concert. It still seems strange to see Christmas decorations without any snow.